HIPAA is a federal law that affects the privacy and security of protected health information. The information you provide in our office will be kept confidential at all times and all patient records are protected in a designated record area. You are entitled to your personal records by signing a release form. Please do not transmit emergency information on this web site. Call our office at 703-709-5400 during office hours or call 911 after hours. HOW YOU CAN GET ACCESS TOTHIS INFORMATION. PLEASE REVIEW IT CAREFULLY. The most common reason why we use or disclose your health information is for treatment, payment or health care operations. Examples of how we use or disclose information for treatment purposes are: setting up an appointment for you; testing or examining your eyes; prescribing glasses, contact lenses, or eye medications and faxing them to be filled; filling of your eyeglass or contact prescription by labs or vendors; showing you low vision aids; referring you to another doctor or clinic for eye care or low vision aids or services. Examples of how we use or disclose health information for payment purposes are: asking you about insurance, or other sources of payment; preparing and sending bills or claims; collecting unpaid amounts (either ourselves or through a collection agency, attorney or bank). If a check is returned from a bank for insufficient funds The Eyewear Gallery will charge any bank fees plus an additional $25 fee. “Health care operations” mean those administrative and managerial functions that we have to do in order to run our office. Examples of how we use or disclose your health information for health care operations are: financial or billing audits; internal quality assurance; personnel decisions; participation in managed care plans; defense of legal matters and business planning. We routinely use your health information inside or outside our office for these purposes without any special permission. If we need to disclose your health medical information disclosed, patient privact rights, The Eyewear Galleryoutside of our office in order to obtain copies of your health information from another professional we will ask for special written permission. Although you have indicated a preferred method of communication on your consent form, we may use one of the other methods of communication you have provided us with to communicate with you if necessary. We sometimes use email to correspond with patients as a convenience. However, these emails are not encrypted and could theoretically be intercepted. Unless you object, you are giving us permission to correspond with you via email in spite of this potential risk. A Continuity of Care (CCD) is a document which summarizes information obtained by your health care providers in a format that can be shared electronically through a highly secure web portal. This information will be shared only with your specified health care providers. The information included in a CCD is current medications, drug allergies and diagnoses. A CCD may be generated for all patient encounters in order to provide a high quality of care by allowing an efficient exchange of vital information between your health care providers. Once your CCD is available you will receive notification and instruction of how to access your CCD at the email address you provided to The Eyewear Gallery. You may opt out of receiving this notification by alerting a member of The Eyewear Gallery staff of your wish to decline the electronic CCD at the time you check in for your appointment. Unless otherwise informed, you are giving The Eyewear Gallery consent to send notification of this document to you via email. We may call, email, send a postcard or text to remind you of scheduled or due appointments, or that it is time to make an appointment. We may also call or write to notify you of other treatments or services available at our office that might help you. Unless you tell us otherwise, we will mail you an appointment reminder on a post card, email you a reminder, and/or leave you a reminder message on your answering machine or with someone who answers your phone if you are not home. We will not make any other uses or disclosures of your health information unless you sign a written “authorization form. If we initiate the process and ask you to sign an authorization form, you do not have to sign it. If you do not sign the authorization, we cannot make the use or disclosure. If you do sign one, you may revoke it at any time unless we have already acted in reliance upon it. Revocations must be in writing. Send them to the office contact person named at the beginning of this Notice. ask us to restrict our uses and disclosures for purposes of treatment (except emergency treatment), payment or health care operations. We do not have to agree to do this, but if we agree, we must honor the restrictions that you want. To ask for a restriction, send a written request to the office contact person at the address, fax or email shown at the beginning of this Notice. ask us to restrict our disclosure to your health plan if you have paid for your services in full. ask to see or to get photocopies or electronic copies of your health or account information. By law, there are a few limited situations in which we can refuse to permit access or copying. For the most part, however, you will be able to review or have a copy of your health information within 30 days of asking us. You may have to pay for photocopies in advance. If we deny your request, we will send you a written explanation, and instructions about how to get an impartial review of our denial if one is legally available. By law, we can have one 30 day extension of the time for us to give you access or photocopies if we send you a written notice of the extension. If you want to review or get photocopies of your health information, send a written request to the office contact person at the address, fax or E mail shown at the beginning of this Notice. get a list of the disclosures that we have made of your health information within the past six years (or a shorter period if you want). By law, the list will not include: disclosures for purposes of treatment, payment or health care operations; disclosures with your authorization; incidental disclosures; disclosures required by law; and some other limited disclosures. You are entitled to one such list per year without charge. If you want more frequent lists, you will have to pay for them in advance. We will usually respond to your request within 60 days of receiving it, but by law we can have one 30 day extension of time if we notify you of the extension in writing. If you want a list, send a written request to the office contact person at the address, fax or E mail shown at the beginning of this Notice. get additional paper copies of this Notice of Privacy Practices upon request. If you want additional paper copies, send a written request to the office contact person at the address, fax or E mail shown at the beginning of this Notice. 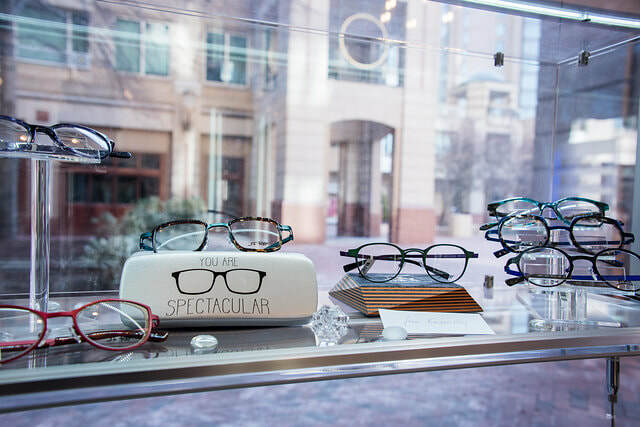 We follow HIPAA guidelines very closely, however, we will inform you if The Eyewear Gallery discovers a breach of protected health information by our office or a covered entity. Our office will contact the individual(s) affected by mail or encrypted email (if email address has been provided.) We will use every effort to contact individuals as set forth by the US Department of Health and Human Services. These individual notifications will be provided without unreasonable delay and no later than 60 days following the discovery. If the breach affects more than 500 individuals we will notify the Secretary of the HHS immediately or if fewer than 500 individuals are affected we will notify the Secretary on an annual basis. By law, we must abide by the terms of this Notice of Privacy Practices until we choose to change it. If we change this Notice, the new privacy practices will apply to your health information that we already have as well as to such information that we may generate in the future. If we change our Notice of Privacy Practices, we will post the new notice in our office, have copies available in our office, and post it on our Web site.